Professional Email Response Types item is for specification of what marketing campaign responses will be downloaded. You can download only these responses you really need. 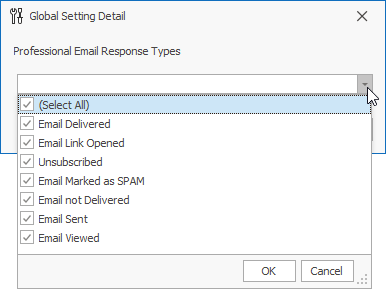 Double-clicking Professional Email Response Types in the list will bring up the Global Setting card. The value field is intended to enter the adjustment value. Select these values of response types you really want to download.